Since the beginning of January, I have started to drink bone broth daily. It warms me up on my morning walk to the gym and it’s very soothing in the evening. When I was a little girl, my mom and grandma would make me a warm cup of chicken bone broth with a squeeze of lemon and I have loved it ever since. Bone broth is easily made using a large stock pan, slow cooker, or instant pot. The instant pot requires no foam skimming and it is the fastest method of all (2 hours of pressure cooking vs. 12-15 hours in the crockpot or stovetop). 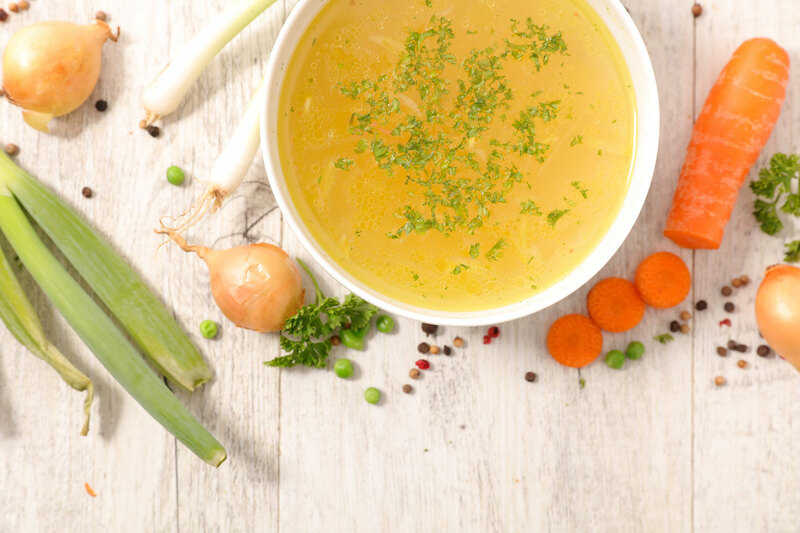 Bone broth is prepared by slowly simmering organic, grass-fed bones (beef, chicken, fish, etc.) in water with an acid, like vinegar, for about 24-36 hours. Chicken and fish bones cook in a lot less time than beef bones, around 12-15 hours. I love to add veggies and spices in, which is optional but definitely encouraged for flavoring and more nutrients! The cool thing about chicken bone broth is that it is made out of ingredients you would usually throw away. You can store chicken bones (from a rotisserie chicken) in airtight glass contains in the freezer until ready to use. You can use the broth as a healing gut drink or as a base for soups, stews, and sauces. I personally love to drink it hot out of a mug, topped with fresh lemon juice and grated ginger. Sometimes, a splash of coconut milk can add a nice flavor to it too. 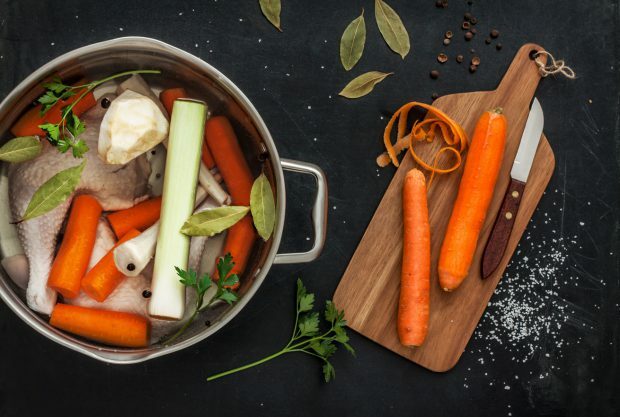 On top of these great health benefits, bone broth also helps to support the beauty of your hair, nails, and skin by increasing collagen production! That’s an added bonus that I know all women will love because collagen is the same anti-aging ingredient found in popular moisturizers and serums. Collagen helps keep skin smooth, tight and reduces the appearance of wrinkles. 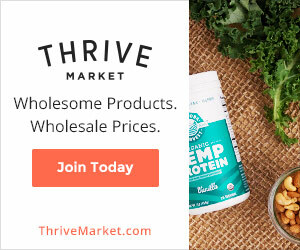 This protein is found in the connective tissue of many animals and is concentrated in bones, marrow, tendons, and ligaments. Once this collagen is broken down it is transformed into gelatin which is easily absorbed (nutrients and all) in the digestive tract. STEP 1. Place the chicken bones in a large stockpot and cover with water. STEP 2. Add the apple cider vinegar, veggies, and herbs. STEP 3. Strain the broth using a mesh strainer to separate the liquid from the solids. STEP 4. Store the bone broth in glass jars like these Mason Jars in the fridge for up to a week or freeze for up to six months. I have a question. If I am using. Regular stock pot ( not a slow cooker not a crock pot or instant cooker) do I need to boil the bones for 24-36 hours .. ? Do I still get the benefit if we boil it for up to 6-8 hours? You can use a regular pot for sure. 6-8 hours will work fine, but the longer you cook them, the better.